New Yorker Magazine. Pronunciation Guide to French Wines. New York, October 17, 1953. - This advertisement by wine seller Barton & Guestier helps the average person to pronounce and purchase French wines with confidence. 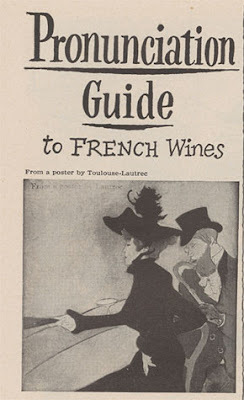 From Song of the Vine: A History of Wine, an exhibit from the Cornell University Library. Thanks. I may check this out on my way back from NYC in June. Whoops! Just noticed I'm a year late.